The call to submit abstracts has been announced to present papers in the SWC2019, which will be held in Santiago, Chile between November 4th and 7th of this year, an event that awaits the attendance of more than 500 people, including scientists, academics, industry professionals and governments from more than 35 countries. The World Solar Energy Congress is organized by the International Solar Energy Society (ISES), the Cold and Solar Heat Program of the International Energy Agency (IEA SHC) and with SERC Chile as the local organizer. The director of SWC2019 is the UCH professor Roberto Román, member of the Academic Dissemination Committee of SERC Chile. Evaluation of solar resources and energy meteorology. SWC2019 will include a wide selection of presentations, trade shows, and discussions on public policies, around energy systems and the requirements imposed by climate change. 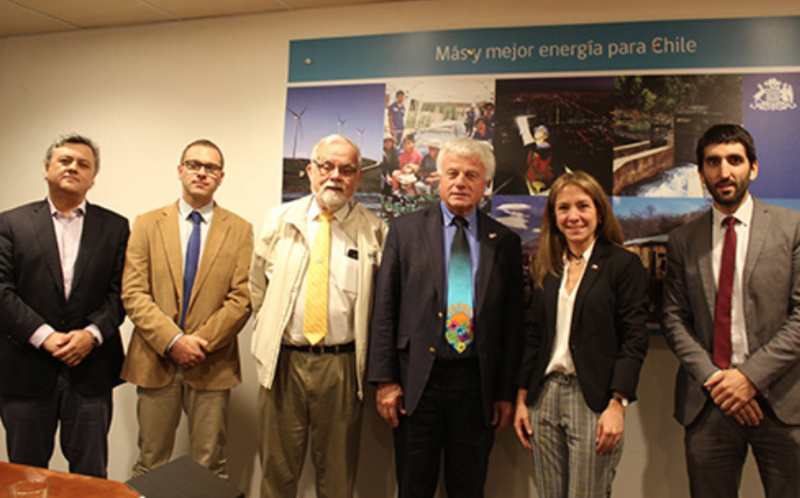 Photo courtesy of the Ministry of Energy: From left to right, Rodrigo Palma, director of SERC Chile; Professor José Miguel Cardemil; Roberto Román, director of SWC2019; Dave Reneé, President of ISES; Susana Jiménez, Minister of Energy; Gabriel Prudencio, leader of the Renewable Energy Division of the Ministry of Energy.